← Are people made from trees? For the last few days I’ve been wondering what I can do, if anything, to make things better in this mad, mad, post-truth, us-and-them world. And I think I have a solution. That’s quite a claim to make, I know. And I might, of course, be lying. But aren’t you the tiniest bit intrigued? It’s become a bit of a preoccupation, pondering how to make a difference. So many people, so perturbed by the world around us, gasping, hopelessly, online. Because it does grind you down, all the online obsessing over Trump, Brexit, Syria, refugees, terrorism … et cetera. And it’s hard to tear free. One more meme, one more blog post. Just one little editorial – and a peek at a US satirical show. I find myself wanting to see Trump fail – but also feeling a frisson at each bold, new departure from previously accepted norms of American presidential behaviour. The world-wide protests, at first, felt reassuring. Articles have been proliferating, penned by people who seem to know, saying protest doesn’t work. Each outburst is a flame, singeing the big man’s sensitive ego. More dangerous still, it distracts attention from other worrying things. Decisions sneaked through. Obscured by slapstick Tweets, or signed-with-a-flourish-executive-orders. ‘The Origins of Totalitarianism,’ by Hannah Arendt – a Jewish refugee from Nazi Germany – is the new must-have tome for the worrying class. Might it really be happening? A forced march to totalitarianism? And if it is, how do we stop it? Well, let’s assume hostile protest is not the way. What then? Add to that sentiment my in-house academic’s frequent references to hunter gatherer societies. Groups where there was no hiding from shame – or from shaming. Behaviour regulated by peer group pressure. And that Hawaiian Huna philosophy I discovered when blogging about the Women’s Rally. Can’t we start to make things better, simply, by being differently? I can’t do this thing alone. I need friends. In fact, I don’t just need friends I need enemies. I need old people and young people. I need men and women, black, white, purple – whatever the hue. I need gays and straights and transgender people. I need everyone in the whole wide world. I need we not me. I thought of flower power. Of love, peace, harmony – and dope. Which brings me back to flowers. I’m no aficionado. I looked him up for this post and read his Plutonian Ode. But it struck me he created, in the concept of flower power, a similarly invincible, fragile – and thereby extremely powerful – antidote to seemingly un-fightable power. Google ‘flower power guns’ and you can track down images that should make you believe you can do anything. The flower power movement’s strength was in its very fragility. OK so it didn’t, ultimately, work. Or last. Nice idea, lousy implementation – especially for women. Now we have the World Wide Web. Now we are all part spider. Every time a finger swipes a screen or pounds a keyboard, our sensitive limbs can feel the trembling of the virtual world. And I’m not saying that flower power is the solution, but it could be a start. I said I had THE solution? No, you said that, I said A solution. But I do feel there’s a crack in the wall, where the light gets in. That Danish video shows our boundaries are far weaker than our common humanity. So how do we break them down? Talk to other people. Don’t assume they’re wrong. They may be, but understand why they may feel the way they do – and remember we’re all human. All weak. Instead of anger, wonder why. Instead of swearing, admit you just don’t understand why that prat overtook you in a 30 mile-an-hour zone. Begin to feel differently yourself and it will have a knock-on reaction. Trust me, I’ve been trying it. It (mostly) works. You’re probably thinking, huh, what a let-down. A wishy-washy stupid solution. John Lennon urged peace and non-violence – and some will say, yeah, and look what happened to him. We do need to argue. Respond constructively, when freedoms and rights are threatened. And so I write in hope. I also write as someone who, as a pre-teenage child, was terrified of nuclear war. The doctor prescribed a tranquilising medicine. I still remember its milky colour and grainy texture. And I still fear what happens when we don’t learn. Please, watch this video of Marlene Dietrich. I defy you not to be moved. And as you wipe away the tears, ask yourself, can we learn, this time, not to pick all the flowers? This entry was posted in Thinking, or ranting, or both and tagged #resist, Beatles, Danish TV2, flower power, Hannah Arendt, John Lennon, Marlene Dietrich, Prague Spring, Scott McKenzie, The Flower Pot Men, totalitarianism. Bookmark the permalink. You are right, we do need to talk to and to listen to each other – not get caught up in the exchange of insults but try to build a society where people think for themselves and care for each other. Thank you Helen. I was worrying that by protesting we are just exacerbating the divides not trying to bridge them of find a common gournd that will work. sW have to live together – we have no alternative. OK in the USA there’s more space but… I watched Dr Strangelove at the weekend, what struck me was how fragile our world in in some ways – and also what a good president Peter Sellers made! So, flowers in our hair, yes? I couldn’t possibly upset the dreamy cocacola ambience! 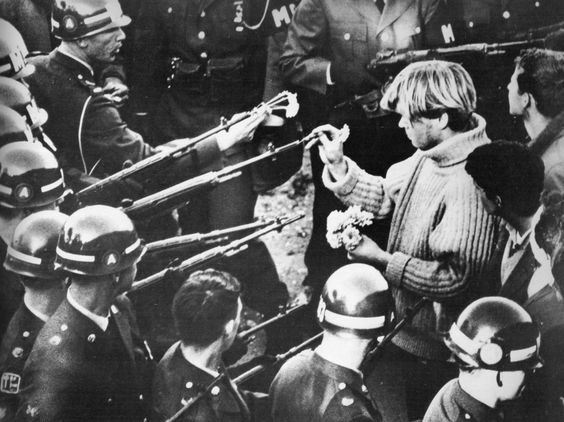 As a disillusioned sixties countercultural activist I just have to say it’s much too late for flowers, though I do have an anecdote about one of the ‘iconic’ photos from the period: It goes like this. I got to know the man responsible for the flowers in the rifles, Michael Bowen, a ‘beat’ painter and friend of all the beat poets [Kerouac, Ginsberg, Ferlinghetti, Corso etc], who was one of the planners of the demonstration [a pre-hippy]. They bought a large consignment of flowers to be air-dropped onto the Pentagon from a private plane, but the CIA got wind of the foul plot and arrested the pilot and plane before Michael got to the airfield. So, with a vanfull of flowers and nowhere to take them, he drove to the demo and distributed them. The rest is history as they say. Wouldn’t that have been great, a load of flowers on the Pentagon. I read how they (Ginsberg et al) tried to circle the Pentagon and do an incantation. Idealistic but a bit odd too. I’m not suggesting misty eyed romantics can sort out the mess that is our world but that shouldn’t stop us trying to make however small a difference. Ha! Thanks Christa, but you don’t even have to find common ground – just … well, I’m sure we could come up with something that would work! I wish I could wave a magic wand and apply that process every few days everywhere. Your Danish clip is so in the spirit of popular culture in the 60s and 70s. 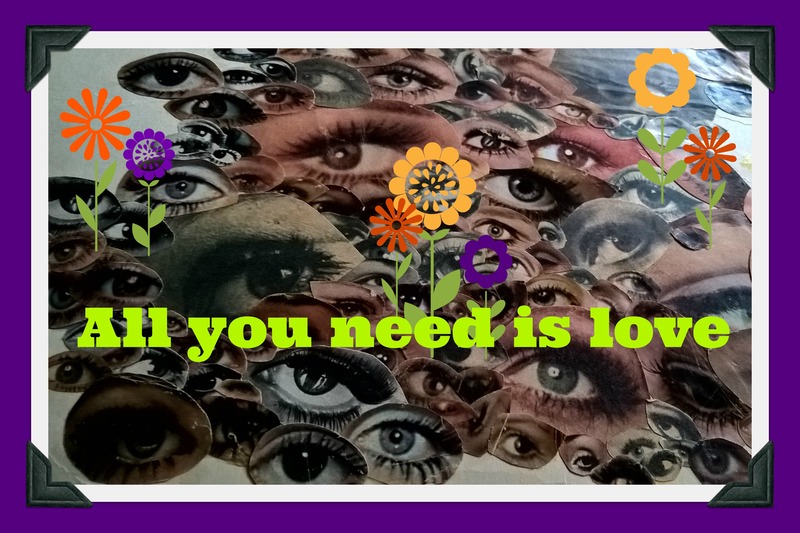 I think of Sister Sledge’s “We Are Family”, Sly & The Family Stones” “Everyday people” and Cat Stevens’ “Peace Train”. I also think of the impact of “West Side Story” on Broadway and as a film. Recognizing that we all want the same things in life. The Marlene Dietrich clip was so personally moving. She was one courageous woman. In 1962 when she sang so passionately “Where have all the soldiers gone” she surely was recalling the many soldiers she sang for in WW II, one of whom was my father who was with a small group of soldiers inside a seminary chapel in Belgium. I was spellbound by Marlene Dietrich, there is so much depth to her interpretation, it was spine tingling. And with your father’s experience – and our knowledge of our shared German/British/American history – so much more than just a performance. “You must be the change you wish to see in the world.” Gandhi’s simple words have resonated for me again and again in the past few weeks. Thank you for bringing them home once again with your beautiful, articulate, wise, impassioned post. May your message of love touch every one of your 1400-some followers. I am really grateful for this lovely comment. Sometimes I wonder if what I am saying is just being scattered to the four winds… You are kind and generous. Gandhi’s words are so appropriate for our times. I too hope my small offering spreads some love. A lovely inspiring piece. A strange coincidence – I was watching the clip of Marlene Dietrich whilst sitting in the conservatory and half way through a blackbird in the garden started singing, a lovely hopeful sound, so cheerful and full of confidence but tear jerking at the same time when combined with the words of the song. Thanks so much Ron. What a lovely descant (?) from the blackbird. Marlene’s beautiful, restrained physically but not emotionally, rendition of that song is exquisitely moving. I am not at all knowledgeable about poetry – thank you for opening the gate to another meadow of words with Gillian Clarke! And mark my words, Mary, Trump won’t last long. ‘Bored now,’ is how it’s going to be in a few years. Thanks Charlie. I think he looks really fed up already -realised what he’s taken on – I hope you’re right! Thank you, Hugh, and welcome to the Husk’s world. You’re right, it’s big and I’ve put it down, it’s added to the towering heap beside my bed. The ‘one day’ heap. I agree, Brave New World is frighteningly relevant. And 1984. We already have newspeak of course. But I’m not going to mention that man. We must remain calm (sometimes). Indeed we must. He who must not be named…. Hooray! Australia branch now officially active!